Inside Self-Storage Store. 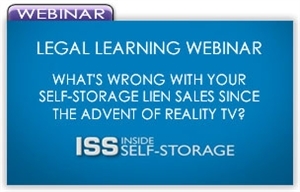 Legal Learning Webinar - What's Wrong With Your Self-Storage Lien Sales Since the Advent of Reality TV? The rise in popularity of reality TV shows "Storage Wars" and "Auction Hunters" has created buzz around self-storage but also some industry misconceptions and challenges. What is happening to self-storage lien sales as a result? Do more attendees equal more profit? Is it good to have all these inexperienced buyers at our auctions? Ultimately, are these shows bad for our business? During this webinar, industry legal expert Jeffrey Greenberger talks about the effect of reality TV on self-storage lien sales and these proposed changes for facility auctions. Believing some of our sales have gotten away from the requirements of the self-storage laws, he explains what operators now need to do to bring their sales back in line with state statutes. Attendees will learn how these changed ways of doing business could expose them to legal liability and, more importantly, how to avoid it.